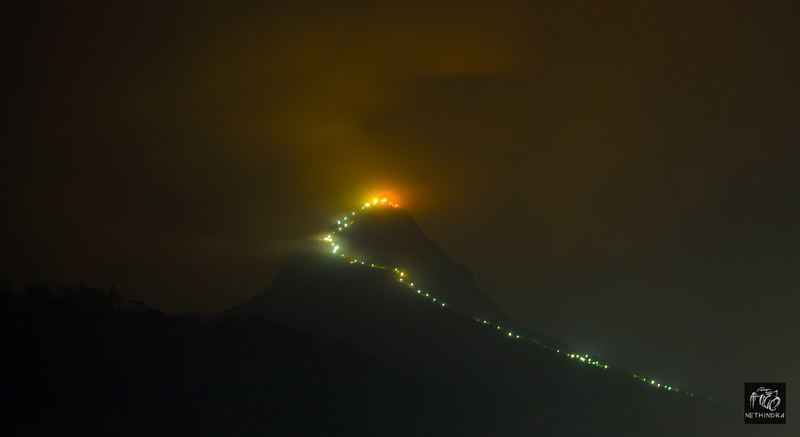 Adam’s peak referred to as “Samanalakanda” (සමනළ කන්ද) is a 2,243 m (7,359 ft) tall mountain located in central Sri Lanka. According to Buddhist belief it contains the sacred footprint or “Sri Paadaya”(ශ්‍රී පාදය) of the Buddha. We began our journey after lunch on Saturday, 21st February 2015. As we approached Nallathanniya, the village at the foot of the mountain, there was a long line of buses and vans parked on either sides of the road hinting that a large crowd was visiting Adam’s Peak over the weekend. Our bus was stopped by the police and we were instructed to leave our bus at that point and take the public transport to Nallathanniya (roughly 5km away from that point) as there was heavy traffic. We arrived at the inn we had arranged dinner around 9 pm. After freshening up and having dinner, we began the hike to the peak around 11 pm. Our objective was to reach the peak by about 5:30 am on the 22nd to view the sunrise. Judging by the crowd, this was going to be quite a challenge.